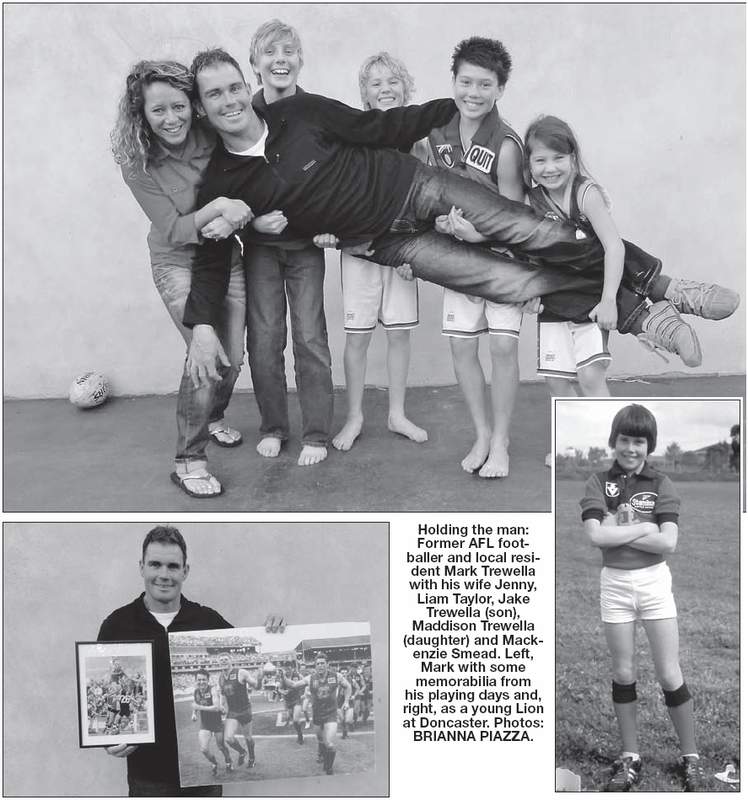 A young Mark Trewella swapped his tennis racquet for a football and went on to play AFL. He tells BRIANNA PIAZZA of his achievements and how he has applied his sports philosophies to everyday life. Q: Hi Mark, tell us a bit about yourself. A: I’ve always grown up with sport. My family and I have lived in Warrandyte for 10 years and my kids play sport and my wife plays basketball. She is very skilled and plays for a team called the Phantoms. They play in the Masters World Games once a year. She’s also got a very good kick – she once won the Mother’s Day Auskick kicking competition. I’m a self-employed builder and I grew up in Doncaster. At the moment I do a bit of assistant coaching. This is my second year and I’ve been going down to the senior footy side to help out. What sports have you played or do you still play? Apart from football, I used to play tennis as a junior and I also had a go at baseball, but I concentrated on the football and tennis. I enjoy surfing and I still surf today – mostly in summer. I always had a footy in my hand. I played Under 10s at East Doncaster. I didn’t really get seriously involved in football until I was 15 and I changed clubs to Doncaster Football Club. I wasn’t getting much of a go as a junior, so I went to play with mates from high school. They were short of numbers and it was one of the best years of football I’ve had because I was able to play wherever I wanted. I really improved because I was working harder. I got a senior game at Under 17s so it pushed me along a bit further. Tell us about your sporting achievements. I used to play pennant tennis and I took part in junior tennis tournaments and then the footy took over. At Doncaster I won Under 16 Best and Fairest and Under 18 Best and Fairest. I then went to Fitzroy Under 19s and won Best and Fairest. When I played reserve footy I won three Best and Fairests there. I played footy for Fitzroy – 23 games at senior football and I played four games with Richmond Football Club. I won Reserves Best and Fairest in 1987, ‘88 and ‘90. I played in the Reserves Grand Final for Fitzroy in 1989 at the MCG. That was a highlight because it was just special and being able to play on Grand Final Day was one of those childhood dreams. To finish the game with thousands of people cheering at the MCG was pretty exciting. We were behind all day, but we came back. It’s a good memory. Are there any sports teams that inspire you? I like the way Geelong and Collingwood play. I’ve played with a lot of good sides that have bonded together as a team and players would do anything for each other. I think Collingwood and Geelong have done that for a while. They know what each person’s going to do and that’s what I’d like to do with the junior club as well. It’s not just about football, it’s also about getting together as mates. What made you decide to take up coaching? I’ve come into Warrandyte as the assistant coach so I help out with the training and a few moves, things like that. I’d love to develop the junior kids a lot more – that’s what my interest is. I enjoy seeing kids have a love for footy and improving themselves with training. My aim would be building 20 kids that want to do things for each other and not just rock up on Saturday and have a kick with the footy. That’s what it’s more about. Sport is important because you make friendships that last a lifetime. I still catch up with people that I played junior footy with and you just get on like old friends again, even though you might not have seen each other for 20 years. Would you say that playing AFL has been one of the best things you’ve ever done? It’s definitely a highlight and I think it puts your life into perspective. You’ve got to work hard to get in the game and that nothing comes easy. If you want to be the best at footy you’ve got to work hard. That’s got to be one of the biggest things that I’ve picked up from sport and you take that into your business life as well. If you had your time back again is there anything you’d do differently regarding football? It would have been good if I were another three inches taller (laughs). I think I would’ve liked to have had more of a go in senior football, but that’s the way it was. It wasn’t from a lack of trying, it’s just that the opportunity wasn’t there. But I’m satisfied.